Will Jeff Suppan make another appearance for the Brewers as their No. 5 starter? Manager Ken Macha said Saturday there has been "some discussion" about that spot in the rotation but wouldn't indicate which way he was leaning. Asked when he'd have to make the decision to keep or replace Suppan, Macha said, "Things have to get in place. (Sunday) would be (Suppan's) side day." MILWAUKEE (AP) Carlos Zambrano's return to the bullpen was OK. Ted Lilly's return from offseason shoulder surgery was even better. 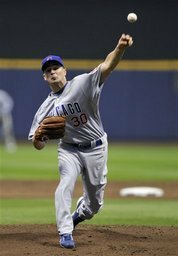 Lilly threw six shutout innings in his season debut, Zambrano made his first appearance out of the bullpen in almost eight years and the Chicago Cubs beat the Milwaukee Brewers 5-1 on Saturday. Would somebody please check the baggage carousel at Mitchell International Airport to see if the Milwaukee Brewers left their bats there when they returned home from Pittsburgh? Chicago's pitchers dominated the action for the second consecutive game Saturday night at Miller Park, allowing the Cubs to pull away to a 5-1 victory over the Brewers in front of a sellout crowd of 43,410. MILWAUKEE -- The moment that might come to define the season for the Cubs -- if not ignite it -- arrived Saturday night with two outs, two on and the Cubs clinging to a two-run lead in the seventh inning at Miller Park. As a sellout crowd roared to life at the unmistakable frame of Carlos Zambrano emerging from the right-field bullpen -- a deafening split between boos and cheers raining down -- the Cubs ushered in their new way of doing business.